Developer: Pacific Coast Power & Light. Genre: Combat Driving. Other versions: GC. Though to list all the WWE games would take a lifetime, there’s a surprising lack of spin-off titles. But in 2003, THQ and Pacific Coast Power & Light tried their hand at something a little different: a mash-up of car combat with WWE wrestlers. It doesn’t sound like a match made in heaven, and to be honest, it doesn’t play like one either. While not bad enough to make you break your console, WWE Crush Hour is an incredibly mediocre attempt to branch into different genres, and one which doesn’t capture the essence of its license. Perhaps the smartest approach the developers took on this one was to base the game’s foundations on Twisted Metal. As a result, playing Crush Hour is fine, but in comparison to Sony’s flagship series, it’s lacking in many spots. When it comes to the art of car combat, Crush Hour feels weak and lifeless. Environments are designed without any care, weapons lack any semblance of firepower and everything just feels quiet and tame, completely the opposite of what a car combat game should be. As a result, it’s just not that fun to play. That being said, there are a couple of good points, as though sometimes unresponsive, the controls feel more natural than most car combat games and the huge roster of characters certainly plays differently enough. While Brock Lesnar gets behind the wheel of a slow-but-deadly truck, Divas will use nimble, if weaker, vehicles. And The Rock drives a luxury sports car, so spot on there. It’s not enough to redeem the experience though. Of course, the big question is how do you tie together a car combat game with WWE superstars? By having Mr. McMahon own all of television, of course! Suddenly, viewers are cooking with Kane, seeing shampoo commercials with Edge and – most importantly to the player – taking part in deathmatches with vehicular combat in a show called Crush Hour. It’s a shame more opportunities weren’t taken with the semi-interesting premise, and it doesn’t really change the season mode much at all. That being said, the season mode does pack a few interesting ideas. Rather than compete in a series of simple deathmatches, there’s a few different kinds of game setups based on actual WWE match types. Hell in a Cell, for example, confines all the players to one area before opening up after several players are destroyed. That being said, the season mode handicaps itself due to its bizarre method of unlockables. Rather than a consistent reward, such as cut-scenes for every character, you unlock a dozen or so extra wrestlers – but everyone else offers nothing. For example, Lita is only unlocked by finishing the season with Matt Hardy), so there is little incentive to completing season with certain characters. And to unlock all the extra characters only takes a couple of hours, negating the season’s replay value. And while exhibition and multiplayer modes may provide some minor fun, they both run their course quickly. Much like the rest of Crush Hour, the presentation is hardly flattering. Environments are plastered with dull colours, cars lack the polygons needed to convey the wrestler’s personality and the frame rate often tanks during gameplay. The use of the wrestlers’ titantrons is pretty nice, though. The sound attempts to convey the atmosphere of WWE, but instead comes up flat. Jim Ross recorded commentary for the game, but he lacks interest, and is as robotic as the matches he’s trying to sell. Meanwhile, little snippets of wrestler’s catchphrases are used when wrestlers get kills, but these get old quickly with very little variation in clips. And the biggest sin, of course, is the weak weaponry, which sounds pathetic. 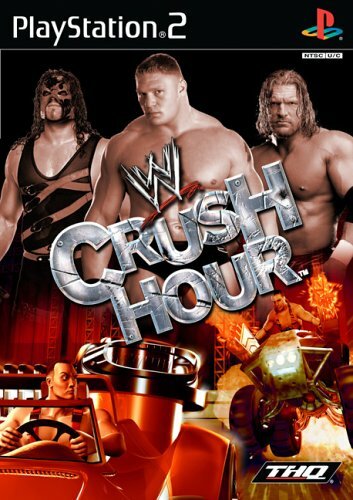 While perhaps not as bad as it could have been, WWE Crush Hour still remains a touch disappointing. As a car combat game, it fails to excite, making each kill feel puny and meaningless. And as a WWE game, it doesn’t live up to the excitement and showmanship of the company, cheaply using catchphrases and the talents of Jim Ross. While some interesting tidbits remain, such as the varied match types, Crush Hour feels menial and underwhelming. That means, whether you’re a fan of car combat games or wrestling itself, there’s not much reason to delve into this one.